This place encompasses everything that this area represents - it might look a little rough around the edges and be filled with a hot mess of strange things but deep down inside it's good. Dammit it's good. And those strange things you see on the wall turn into what I like to call "character." Their menu offers up some traditional menu items like omelets, french toast, waffles, pancakes with sandwiches and salads for lunch. I recommend you get here earlier for breakfast because this place fills up fast! We got there around 11 and the place was packed, luckily the staff there is super friendly and he got us seated as quickly as possible (then again that might have had something to do with my "get up now I'm freaking hungry don't get that last cup of coffee" stare at the filled tables). Since I had omelet on the brain, I ordered "The Dougie" which was stuffed with onions, peppers, tomatoes, black beans, spinach, and cheddar cheese with wheat toast and home fries. My omelet was very tasty, I asked for my onions and peppers to be cooked down and they listened! The home fries were brown and crispy just the way I like em but my toast was a little soggy, it pretty much just tasted like soft bread. One thing they had here was green Tobasco sauce. Normally I am not a fan of Tobasco, to me it just tastes like spicy vinegar and I would prefer Texas Pete or some other brand but this stuff is amazing! It's more mild then it's red cousin and the flavor of vinegar isn't nearly as overpowering - I highly suggest you try some on your eggs! 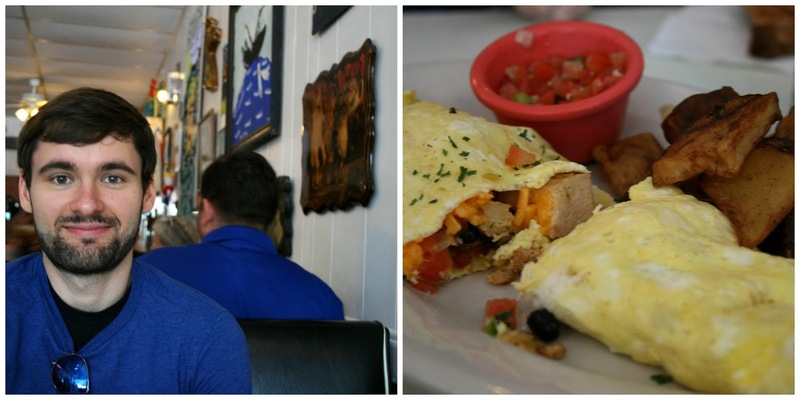 Lewis decided on "The Tropical" which was and omelet filled with onions, chicken tomatoes, black beans, and cheddar cheese also with home fries and wheat bread (it also wasn't toasted). He really enjoyed the chicken which threw him off at first but he said that everything tasted really well together...just look at that face. That is one happy, well fed face. It turns out I am kinda happy Cool Moose was closed that day because it forced us to try this local gem of a place. The food is simple but delicious and the staff is awesome! 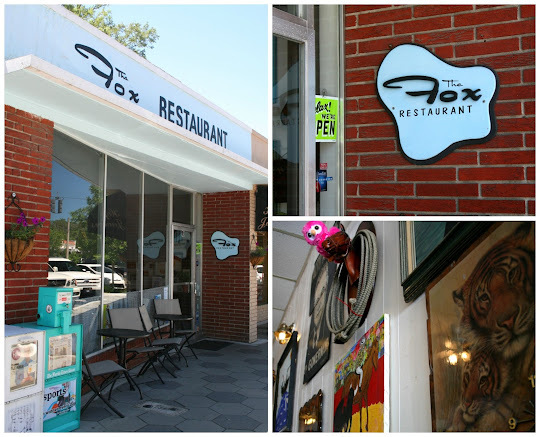 Definitely check out the Fox for breakfast or lunch next time you're in this neck of the woods!